To spatchcock the chicken, place the chicken breast-side down, with the legs towards you. You can at this point use two skewers to secure the legs and keep the bird flat, by running the skewers diagonally through the breast and thigh meat, or just leave it as-is. In a small bowl, combine the baharat and sumac. Place the chicken in a baking dish and rub the skin on both sides with some olive oil, salt, pepper, and the spice mix, and place the chicken so that it’s breast-side up. 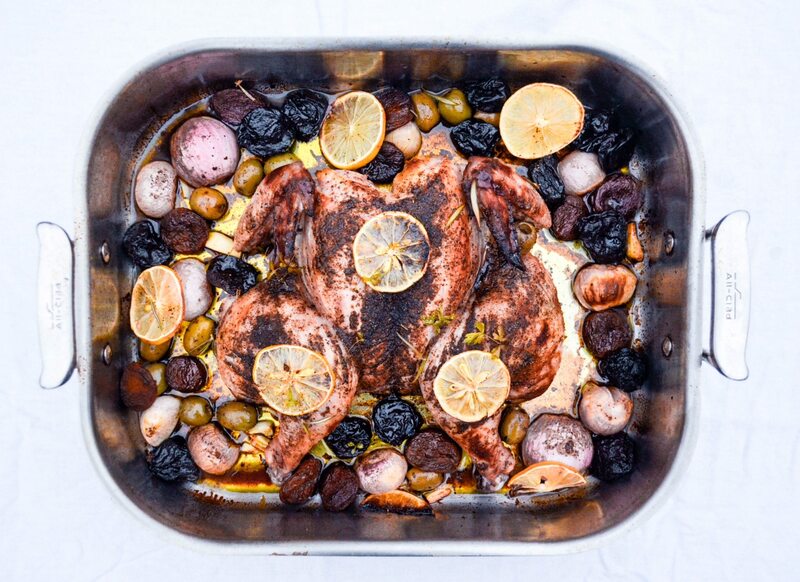 Evenly disperse the garlic, shallots, prunes, apricots, olives, and lemon slices around the bird, making sure to place some of the lemon slices on the chicken breasts themselves. Feel free here to sprinkle these perimeter ingredients with some extra salt, pepper, baharat, and sumac, and even a little bit more olive oil. Drizzle everything with honey, place in the oven, and roast for about 30-40 minutes until the bird is cooked through, but still juicy and tender.